Gibraltar, located at the bottom of Spain on the southern end of the Iberian Peninsula, was under the rule of the Moors - a group of Muslim inhabitants - from AD711 to 1462, like most of Spain. What does Spain say... and Gibraltarians? Gibraltar - a territory with a population of 32,000 - believes it has the right of self determination - something Spain disputes. Gibraltar's location on the Strait also gives it important access to commercial shipping, oil transportation and military-related transport. Fishing rights are another point of contention, with both sides complaining about incursions. Although it is part of the EU, Gibraltar is outside the VAT area and the customs union - a group of states that have agreed to charge the same import duties as each other and usually allow free trade between themselves. This means it is free to to set its own tariffs on goods imported from outside the EU. Spain also believes the border is being abused and draining Spanish resources, with the smuggling of cigarettes being a particular bugbear. What's the latest spat all about? Following the triggering of formal Brexit negotiations, it was revealed the EU's draft document on its Brexit strategy said no agreement on its future relationship with the UK would apply to Gibraltar without the consent of Spain - giving it a potential veto. Spain - a member of the EU - reportedly lobbied for the condition. Gibraltar, which voted by 96% to stay in the EU in June's referendum, accused Spain of using Brexit to pursue its territorial aims. Some have criticised the UK government for not mentioning Gibraltar in its 2,200-word letter triggering Article 50, but ministers have said the territory is referred to in another document and have stressed their commitment to protecting the interests of the territory. UK Foreign Secretary Boris Johnson said the "sovereignty of Gibraltar is unchanged and is not going to change". 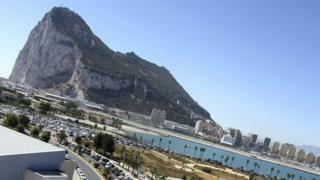 Spain said it had been "surprised by the tone of comments coming out of Britain" about Gibraltar.